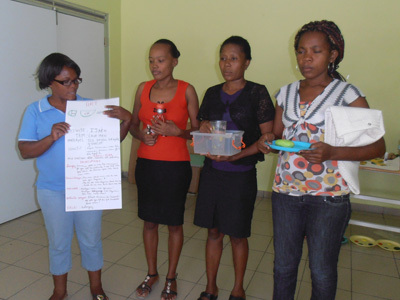 Teacher training-teachers giving an example on thematic lesson about water. We started out our new school year with a week-long intensive training for all teachers and assistants at the St. Germaine School. Here in Haiti there is very little in the way of special education services and there is no educational program for the training of special education teachers. The training workshops were a great success with individuals from other organizations around the country in attendance. Lesson about water making rain. Our teachers were very excited to use their new knowledge with the students and we have seen many positive improvements as a result. One area that has proved valuable in our new approach is the use of thematic teaching. Our first month of school focused on the theme of “Water.” All classes targeted concepts relating to weather, bodies of water, the uses of water, water safety, marine life, and many other fun concepts! 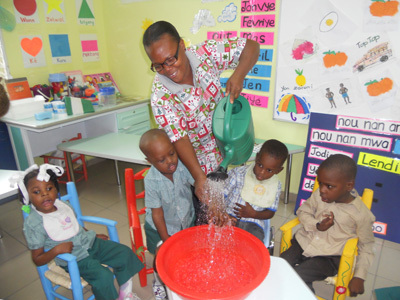 Our teachers created simple learning activities such as creating rain pouring from a watering can so the students could experience the lesson with many of their senses. Students listen to a lesson about pool safety. 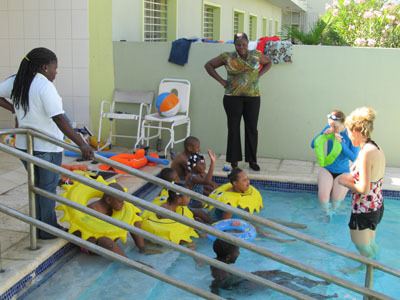 Using this introductory theme allowed us to initiate frequent use of our therapy pool, which the kids absolutely love! We were able to incorporate concepts and vocabulary into our time with the children in the pool. We talked about floating and sinking, under and over, hot and cold, as well as color. The pool was also excellent for children with significant physical disabilities as they were able to move more freely in the water with support. It is a great sensorial and experiential learning environment! All of our students responded very enthusiastically to their pool time and we are planning to make pool time a weekly occurrence. Students having a great time in the pool. In addition, due to frequent tropical storms we have experienced recently, this theme allowed us to discuss rain, thunder, lightning, mud, flooding, cholera, and hurricane safety. We used imagery from local public health posters to acquaint the children with important health message and issues that are essential to their daily here in Haiti. We also incorporated very important life skills such some simple cooking skills using water-making juice, boiling eggs, and washing hands. Volunteer with young student enjoying the freedom of movement the pool provides. We are seeing much success with our thematic teaching method. One rewarding moment for our team came when Jefferson excitedly came to tell us that rain had fallen the night before at his house and he had heard thunder! It is precious moments like this that validate the importance of our work to develop the capacity of each student to learn. It also reinforces the need for continued development of special education programs and training of local teachers here in Haiti. Congratulations to teachers and pupils! I am so very excited to see Thematic Teaching implemented at the school!! And how wonderful to see you all embracing it in a month long theme. My heart is warmed truly to see our (too short) week at St. Germaine taken up with the warmth, caring, and creativity that I just knew your staff would bring to it. Please extend my congratulations to them all.